All creatures give out a smell when aroused, it seems; certainly humans do. James Lees-Milne was born in Wickhamford, Worcestershire, England. He was an English writer. 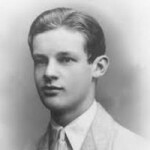 He earned a BA degree in History from Oxford University in 1931. From 1931 to 1935, he was Private Secretary to George Lloyd, 1st Baron Lloyd of Dolobran. In 1936, he was appointed secretary of the Country Houses Committee of the National Trust. He wrote several books include: The Age of Adam, The age of Inigo Jones, Roman mornings, Earls of creation, Another Self(autobiographical novel), William Beckford, Round the Clock, Harold Nicolson(biography), The Last Stuarts, The Bachelor Duke(biography), Ruthenshaw, and Fourteen Friends. He wrote several diaries include: Ancestral Voices, Caves of Ice, A Mingled Measure, Ancient as the Hills, Deep Romantic Chasm, Beneath a Waning Moon, and The Milk of Paradise.